UPDATE: 9:45 p.m. – Brian Head fire is now 1,800 acres, 15 percent contained. There are currently nine helicopters, 30 engines and nine crews that comprise 462 total firefighters. 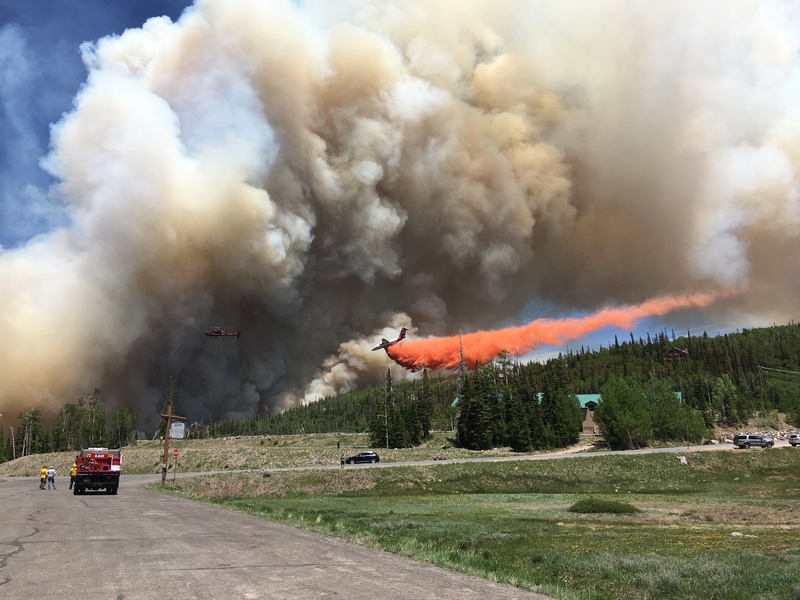 CEDAR CITY – The Brian Head fire that has already cost $1.8 million for firefighting efforts was started using a weed torch in dry conditions, Gov. Gary Herbert tweeted Tuesday before a 1 p.m. news conference. “A good reminder to be #firewise,” Herbert continued in his tweet. 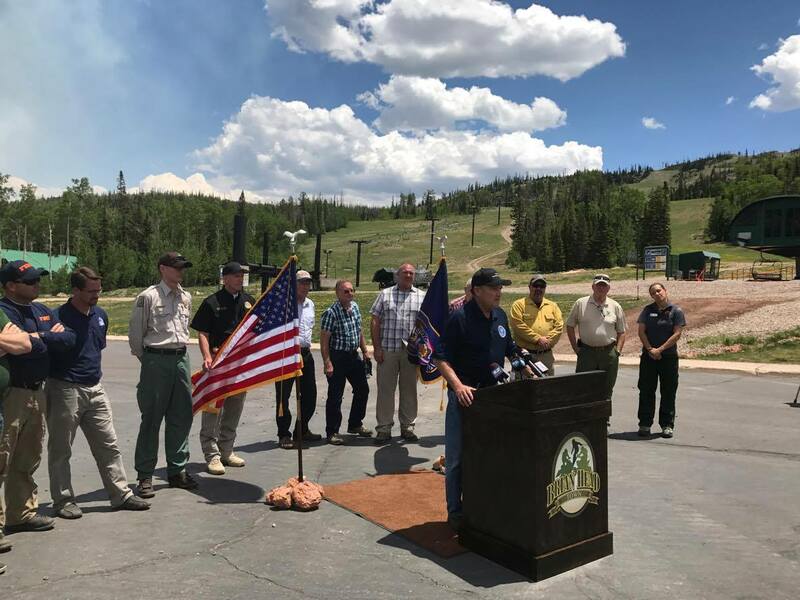 The governor, as well as state and local officials, declined to discuss the details of Herbert’s tweet during the news conference held at Brian Head, focusing instead on wildfire prevention throughout the summer months. Pointing to the number of wildfires already burning throughout the state this year, Herbert urged caution going forward. Officials confirmed they are investigating the cause of the fire but would not say whether they believe criminal charges will be forthcoming. Area Fire Management Officer Mike Melton for the Utah Division of Forestry, Fire and State Lands, said the state will seek restitution from the person who allegedly started the fire via the court system. The state is concerned about future fires in the area with the number of dead trees that have been killed by bark beetles in the last 15 years. Herbert referred to a lawsuit filed by Southern Utah Wilderness Alliance years ago he said prevented logging in the area and in turn, created a fire hazard. The governor stressed responsible management of public lands. An aerial look at the fire prompted Herbert to promise that the state will impose stricter fire restrictions beginning at midnight in five Southern Utah counties with more to come later. The fire forced the evacuation of about 750 residents and visitors Saturday and the closure of several businesses and hotels. The formal opening of the Brian Head resort for the summer season expected next week may also be delayed, Bret Howser, Brian Head town manager, said. Brian Head Resort Marketing Director, Ron Burgess, issued a news release Tuesday afternoon stating the resort will resume full operations and normal activities as soon as possible. Meanwhile, the businesses located in Brian Head continue to lose money daily. Likewise, the small resort town that has become a popular destination for many Las Vegas and California residents is losing out on sales tax, money that is used to help operate the town’s business such as road maintenance and public safety. Howser could not put a dollar amount on the losses but said there is no doubt local businesses will take a financial hit from the fire. By Tuesday afternoon, the fire had burned nearly 1,000 acres with only 4 percent contained. Six helicopters, 23 engines and 11 crews, comprised of about 420 firefighters, remain in the area, officials said. U.S. Forest Service spokeswoman Cigi Burton reported two firefighters were injured Monday. One suffered a puncture wound to the arm, while the other had a concussion. One home has been destroyed and three others have been reported damaged. However, officials have warned that more homes may be damaged but not yet identified because firefighters have not had a chance to check some neighborhoods. The resort town has about 1,200 homes and condos and about 100 full-time residents, many of whom were able to stay with nearby family, officials said. State Route 143 remained closed from Parowan to the junction of state Route 148 near Cedar Breaks National Monument. As of 8:45 p.m. officials confirmed the fire has flared up again and increased about 500 acres due to low humidity, shifting winds and higher temperatures. It is now moving north and is close to the Thunder Ridge Boy Scout camp but there are currently no boy scouts in the area. Brian Head is not threatened. Crews are re-evaluating, Melton said. Dixie National Forest also has issued road and trail closures, which include Marathon Trail No. 3224 from Forest Road 048 (Sidney Valley), Sidney Peaks Trail No. 3210, Mace’s Run Trail No. 3219, Dark Hollow Trail No. 3232, Hendricks Lake Trail No. 3249, and Forest Road 047 (Brian Head Peak Road). Speaking of loss business taxes, it will take a lot of lift tickets and pizza slices to pay for the Guv to flying around in a $4,500 per hour UH-60 Blackhawk. Just sayin. I saw 5 of them in his airborne entourage. Brian Head population is less than 100, definitely not even close to 1,000. So is the Southern Utah Wilderness Alliance happy now that their goal has been met? Weed torch started this, fine this ahole for the cost for starting this….the fire has no grown to 10,000 acres….yet we are still allowing fireworks to be sold and used here? Anything for a buck right Govenor?